Do you know what to do if you get injured at work? Do you know where to call if you are in crisis? Have you ever wondered if it’s safe to get on the road to drive to your next rotation? Are you looking to connect with mental health services? 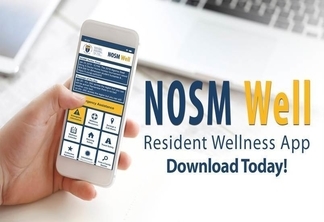 The Postgraduate Wellness Program at the Northern Ontario School of Medicine (NOSM) is pleased to announce the launch of NOSM Well, a new digital app designed to promote healthy learning and working environments among residents, as well as help them develop skills in self-care and provide support for those who may struggling personally or professionally. Within the app, NOSM residents will find many helpful features including emergency information, a means of contacting the Wellness Program, a calendar of wellness events, help finding a family doctor, and even a way to secure a cab ride and submit a receipt for reimbursement if you are too exhausted to drive home from work. The must-have NOSM Well app is free to all residents and can be downloaded from the Google Play Store and the App Store. Check it out and send feedback at residentwellness@nosm.ca or directly through the app.